I already spend quite a lot of time in Birmingham city centre, but since Grand Central opened the temptation to take the 20 minute train journey from Coventry has been even bigger. Not only do they have every pretty shop you could possibly want (one day Jo Malone, one day), but the increase in places to eat now is insane. Whatever you’re in the mood for, they’ve got it. I was recently invited along to check out one of Grand Central’s food jaunts, Square Pie, and obviously I said yes. I think if you cut me open I might actually bleed gravy*, so the opportunity to eat pie and mash was not being passed up. 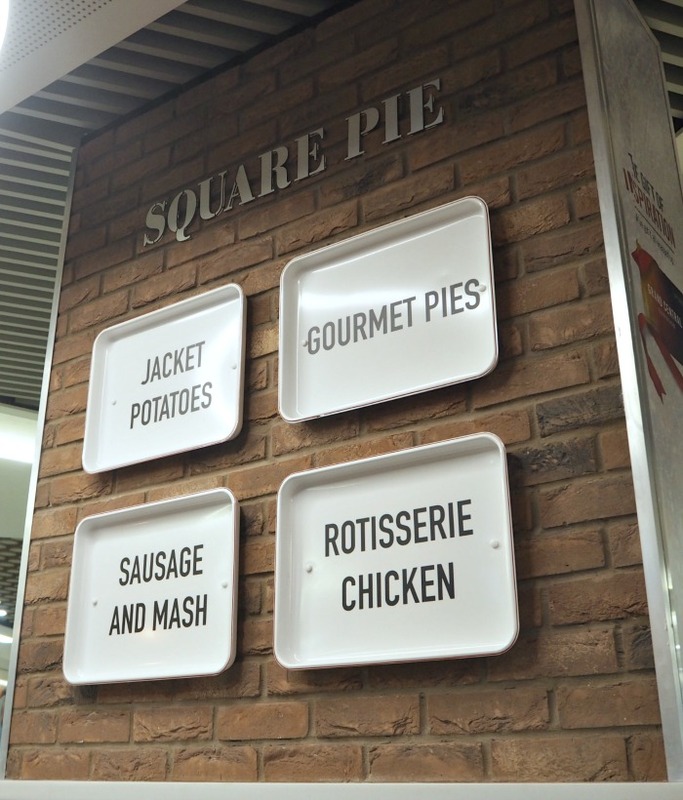 Square Pie is located in the central food court-esque area of Grand Central, making it super convenient for shoppers as well as people who have some time to kill waiting for trains from Birmingham New Street. I went along with Lauren on a recent shopping trip and it was DIVINE. I opted for the Spinach, Sweet Potato and Goats Cheese pie, which is apparently Kate Moss’ favourite pie (nope, I’m not sure where that fact comes from or what the relevance is either, but I’ll take it). 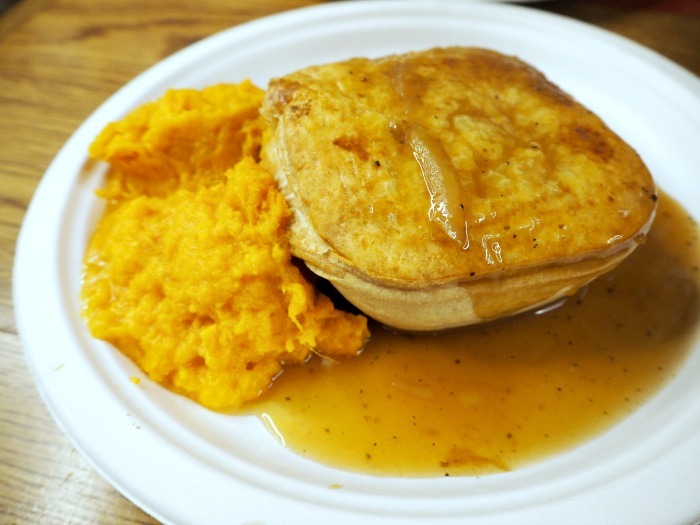 You can also get a similar sweet potato and goats cheese pie as one of their ‘skinny pies’, which comes without the short crust base. This is a really nice idea, but I wasn’t in a dieting mood and wanted ALL THE CARBS AND GRAVY, THANKS. Side-wise, I also went for sweet potato mash because I’m a sweet potato fiend, but they also have regular mash, chips, peas, coleslaw and of course gravy. 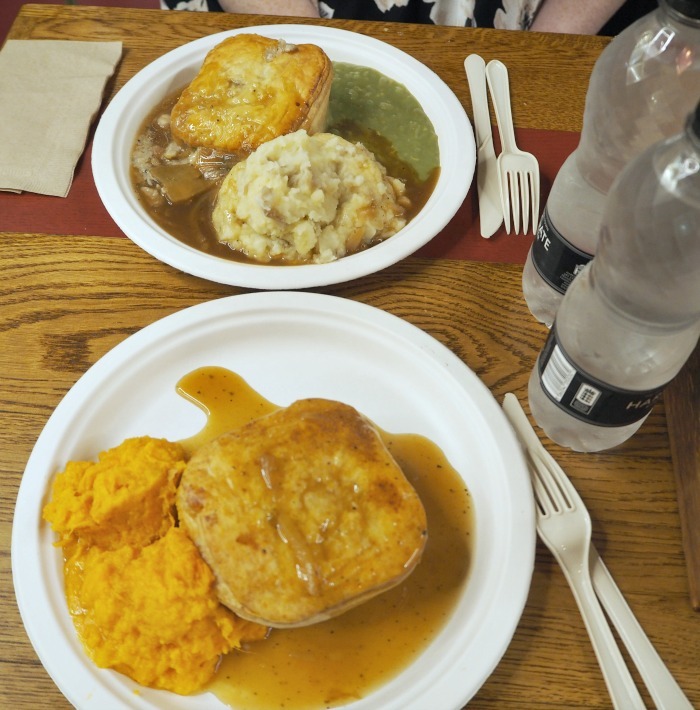 Lauren went for the chicken and mushroom pie, with sides of mash and mushy peas.We barely spoke during the meal because we were both too busy stuffing our faces and grunting at how bloody delicious the pies were. The ultimate comfort food, you can tell that these are so fresh and well made. 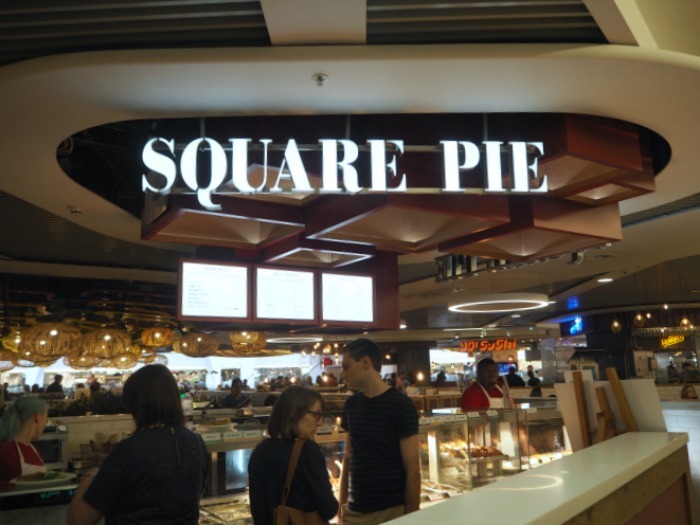 Square Pie operates on a Subway-esque service counter, where you go along picking your pie and sides before paying at the til. Like I said, this makes it SO convenient for people out and about on a shopping trip – but it might be worth bearing in mind if you’re looking for more a sit-down-and-spend-an-hour meal. Like, I wouldn’t exactly recommend going to Square Pie on a hot date (unless you’re going on a date with me, because a quick pie is all I want and need in life); but it’s perfect for grabbing a quick meal. An extra uhhhh-mazing thing about Square Pie is that all of the pies are available unbaked to take away and eat later. This is way too tempting, and I’m actually glad that I don’t live in Birmingham city centre or I imagine I’d end up eating pie every day of the week. Fantastic for the tastebuds, disastrous for my Joni jeans. I’d like to say a huge thank you to the staff at Square Pie who treated Lauren and I so well! I’ll definitely be going back soon. * me bleeding gravy has not been confirmed by any medical professionals. But I have my strong suspicions. This looks absolutely bloody lush. Nothing beats a good pie! When I still lived at home I used to love cooking pies for my family but since going to uni I’m far too lazy.. and poor haha! Thanks for stopping over on my blog the other day, sorry it’s taken me so long to get back to you! But I’m really glad I came and visited your blog. 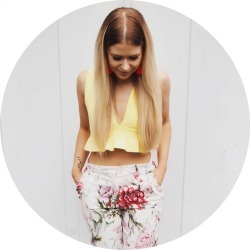 Do you want to follow each other on Bloglovin’ so we can keep up with each others’ posts?